Our Central Park Meetup Group met at the Conservatory Garden again and it was beastly hot. 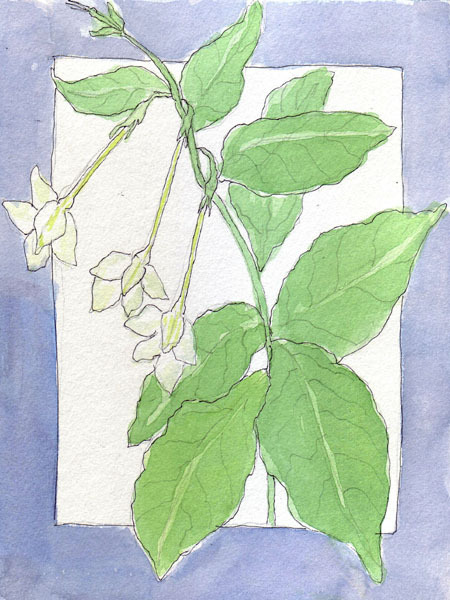 However, there were enough non-wilted flowers to paint. 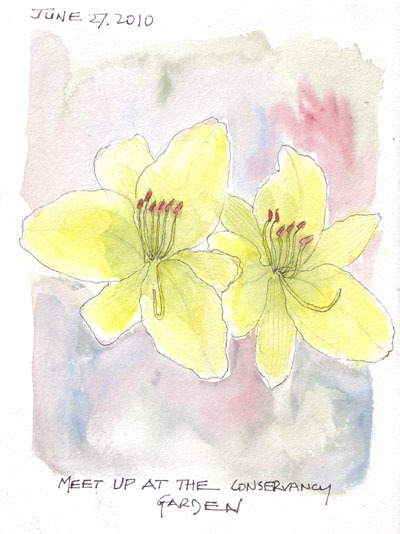 They are not labelled and I have little practical knowledge of flowers - but I love drawing individual blooms. There are two wonderful fountains in the Garden. One of the fountain areas was the site for a lovely wedding. The other fountain, the Three Dancing Maidens, was in bright sunlight. But we discovered that we could dangle our feet into ice cold fountain water until the guards reprimanded us. 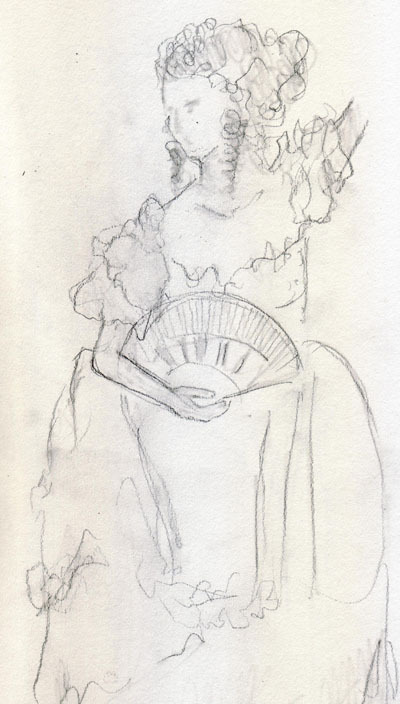 I drew this fountain twcie before (see here and here) and this time I decided to just draw one of the maidens. I had just enough time before the guards came! Following Meetup, I went to the Metropolitan Museum of Art for a special afternoon program on Picasso to go along with their huge current exhibit. Francois Gilot gave a long and excellent lecture on her encounter with Picasso, She lived with him for 10 years and had two children with him. Professor Michael Fitggerald presented detailed information about the first private American collectors of Picasso's paintings and the history of the Met vs MoMA and their Picasso acquisitions. Then there was a wonderful French film (The Mystery of Picasso - 1955) in which Picasso drew on one side of a support and we the audience just saw the lines forming and colored inks being added. It was mesmerizing. 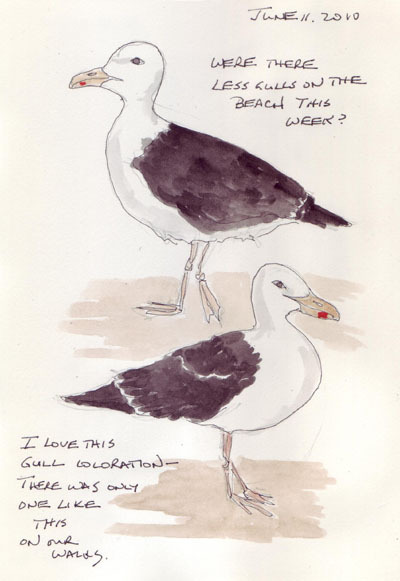 We were at the beach for several days in June and I never uploaded any of the daily drawings that I did. 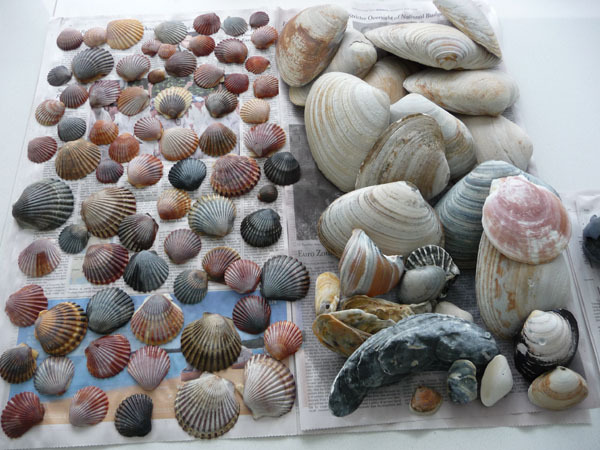 It was an amazing week for finding shells on the beach - last year we barely found any and this year I only brought home perfect ones. 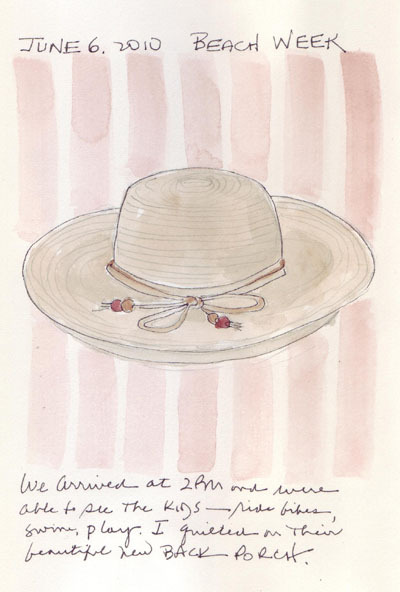 My Straw Hat - but it was too breezy to wear it on our morning walks. 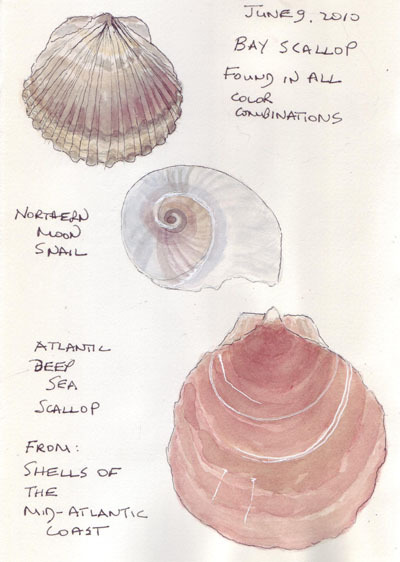 A few of my favorite types of shells - the variation in color of the moon snails and bay scallop shells is truly amazing. 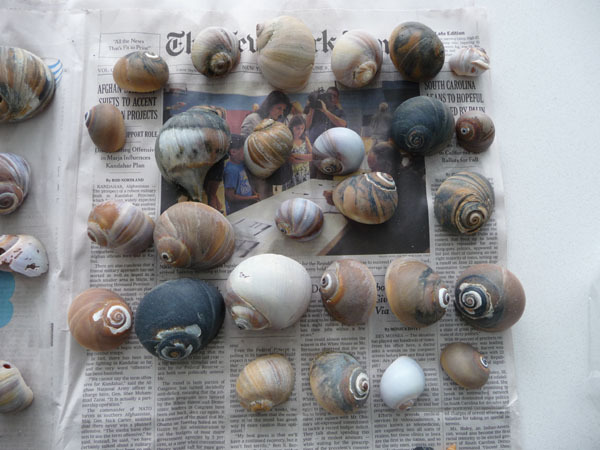 I could use one shell for an example of nature's perfect color combinations each time I paint. I love the seagulls and this was the only one we saw with this coloration. 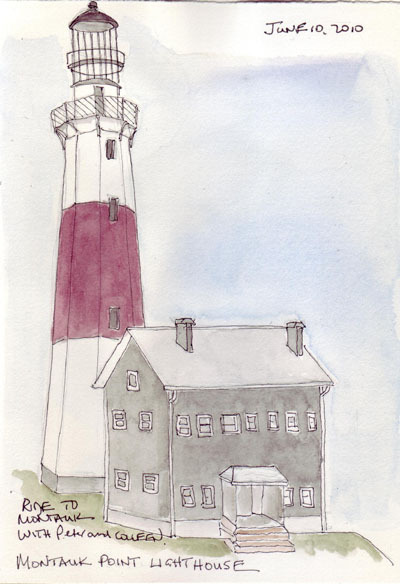 We took a ride to the end of the South Fork to the Montauk Point Lighthouse for the first time. It is a wonderful place for drawing and painting. There are two weekly figure drawing sessions at the Society of Illustrators in New York City - and in one of them models are partially or fully clothed. Last week was the first time that I was there when two models were fully in costume - a Marie Antoinette type costume for one and a pirate costume for the other. It was the hardest sketching I've done there - a huge challenge. 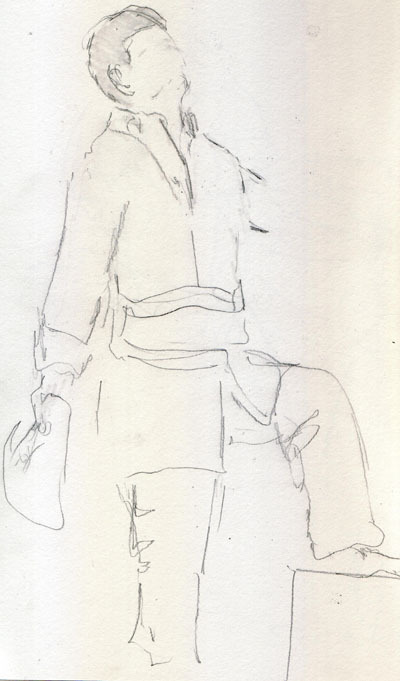 Here is one of my 2 minute sketches of the male - in pirate costume, but without all of the braid and other decoration on his jacket, belt, and hat which I just didn't have time to include. We took my 6 year old grandson Henry to Lincoln Center for an open rehearsal of the New York Philharmonic. He takes violin lessons and is very interested in music - and seemed excited when we invited him. He read some great children's books about composers and I sketched before the rehearsal began. It was the first time that I sketched live musicians while they played. 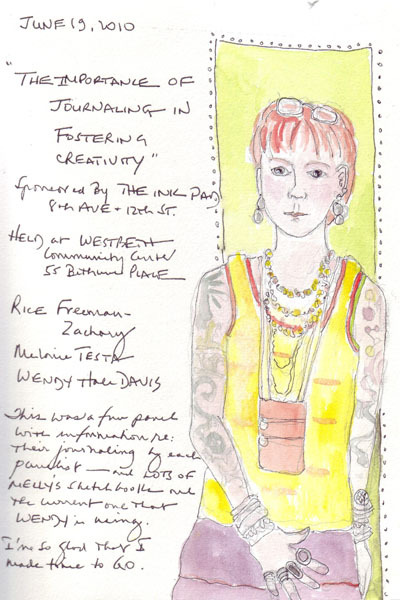 Yesterday I went to a panel discussion about creativity and sketchbooks - presented by Rice Freeman-Zachary (whose 2 books I loved), with my friend Melanie Testa, and Wendy Hale Davis. Rice is such a colorful character that I just had to sketch her while I listened. And I didn't even put on all the jewelry that she was wearing. Although the Meet-up Group usually sketches in Central Park during the non-winter months, this past Saturday we sketched at Bryant Park which is located behind the New York Public Library. It was a beautiful day and the Park was full. We sketched in 3 separate areas in the Park and shared our sketchbooks at the end of each. Here are my 3 watercolor journal pages from the afternoon. This is the fountain on the west side of the Park. There are umbrellas, chairs, and lamposts everywhere! These were the flowers blooming in the big planters that were scattered all around the Park.